Baby It's Cold Outside Holiday Open House and Charity Soup Festival - Baby Point Gates B.I.A. The count down begins: 7 days to go! Get your toonies ready and come hungry to sample delicious soup. Your support will help deserving children get holiday gifts via the Santa Claus Fund!!! 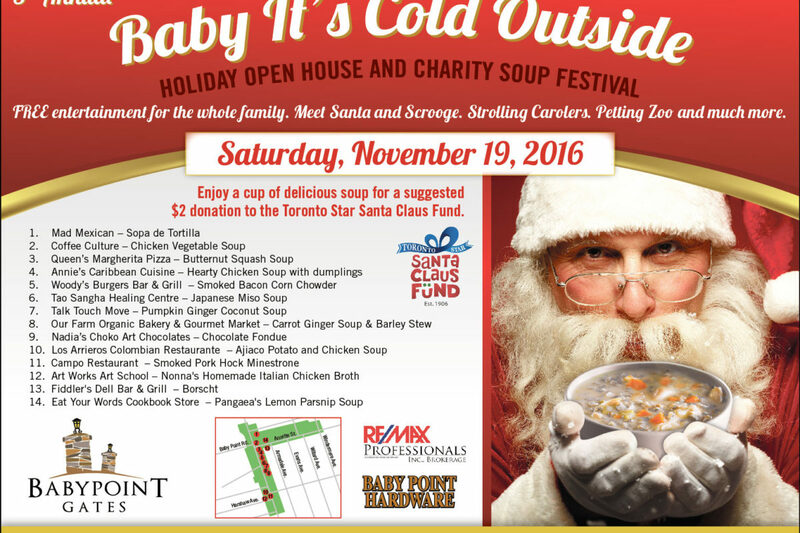 The Baby Point Gates BIA invites the community to get into the holiday spirit at their 5th Annual Baby it’s Cold Outside Holiday Open House and Charity Soup Festival set for Saturday, November 19, 2016. Soup will be served between 11 am – 3pm – or while supplies last. The Charity Soup Festival is a new addition to the traditional Baby it’s Cold Outside Holiday Open House Festivities. For a suggested $2.00 donation, shoppers can sample a delicious cup of soup from the many participating restaurateurs and merchants in the Baby Point Gates BIA.